i made this sweatshirt for my husband about a year ago. i wanted to share it because it is one of the most loved gifts i have ever given, considering neal has worn it pretty much every day since, minus the days it has been in the wash. it took me probably 20 plus hours to complete, and was worth every minute. with japanese woodcut artist hokusai as my inspiration, i cut small pieces of fabric and made the wave form as i went. the wave wraps around the front of the hoodie, and i added a little flying seagull on the hood. i used fusible webbing, and stitched the edges by hand and machine. 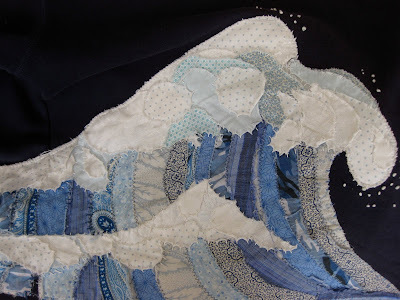 i left the edges of the fabric raw, as i think it adds to the texture of the wave (and i don't have that much patience). i finished it off with a little wave spray, done with french knots. the end result is what is referred to by neal as "the best present ever."